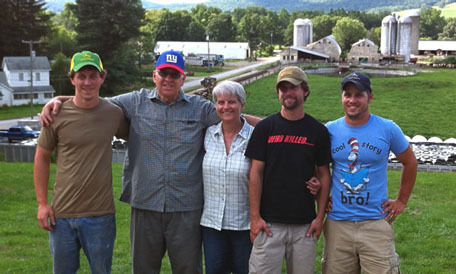 Engelbert Farms, run by Kevin and Lisa Engelbert and their three sons, is a farm sponsor of the Food & Health Network. For several decades, the Engelbert farm followed the “high production per acre” philosophy, resulting in heavy irrigation, fertilization, and pesticide use. Soil health was at an all-time low on their farm. Animal health suffered as well. By the early 1980s, Kevin stopped using chemicals on his land and his animals and hasn’t looked back. I interviewed Lisa to learn more about their farm and its contributions to the local food system. You became organic certified with NOFA-NY in 1984-85, making your farm the first organic dairy in the United States. 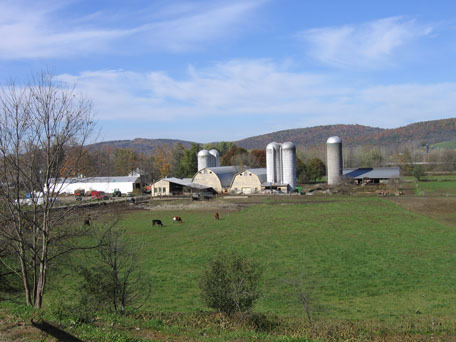 What challenges did you face at the time, given that you were the only organic dairy farm NOFA-NY had yet seen? The biggest challenge was having no market for our organic milk. We contacted several milk companies to see if they would be interested in starting an organic milk line, or even to process for us so we could start our own brand, but they all thought organic was a fad. We shipped organic milk into the conventional market for almost 20 years without a stable market for all of our milk. Can you describe what it was like to transition from conventional to organic and sustainable practices? Challenges, successes, etc? We were very concerned about what might happen with bugs, weeds, etc. As our soil continued to heal from extensive chemical use, we saw less of an issue with bugs. Bugs generally seem to attack weak plants, but leave healthy plants alone. It took 7 years before Kevin was confident enough to sell the sprayer. Weeds can be a challenge, because you must cultivate at just the right time to achieve good weed control. If you are delayed by weather, i.e., too much rain at the wrong time, weeds can get ahead of you. Once we stopped feeding medicated milk replacer to our calves, and started feeding whole milk, our calf mortality dropped significantly. Medicated milk replacer contains antibiotics, and once you stopped feeding it, calves seemed to get sick. Once we started raising calves on whole milk like nature intended, we found that our calves were much healthier. After we stopped using chemicals on our land, we saw a dramatic increase in the health of our cows, too. Before we started farming organically, our cows were constantly sick with mastitis, milk fever, breeding problems, foot and leg problems. Over the first few years of farming organically, the health of our cows started to improve as our soil became healthier. How has your farm diversified and grown over the years? Our three sons all came back to the farm after graduating from college. When our first son came back, we knew we would need to diversify to be able to support more families. He had since taken a job off the farm, but is still around helping out when he can. Then when our second and third sons decided to come back, we added additional value-added products. Up until 2004 we were just an organic dairy farm. In 2004 we became certified for organic beef, pork and veal, and started our own organic meat business. We sold at farmers markets, from the farm and to a few stores and restaurants. In 2008, we became certified to grind and mix organic feed for other farmers. In 2009 we opened our farm store and started having small amounts of our milk made into organic cheese, which we sold under our own label. In the years since, we’ve expanded our offerings at our farm store to include organic vegetables, and products from other local farms. Our farm is currently supporting four Engelbert families, plus three full-time employees and several part-time employees. What do you think is needed to support the local food community? Less regulation is the first thing that comes to mind. For example, people should be able to choose what to put in their bodies. Unless you have a raw milk license, you can’t sell raw milk in New York. A raw milk license only allows you to sell from the farm. You cannot transport raw milk and deliver it to customers, and you can’t sell it at a farmer’s market or in stores. Testing is done, but the farmer has no control over the testing. If even one test comes back above one of the state’s thresholds, they don’t give you an opportunity to investigate whether it was a sampling error, or to determine if there really is a problem. They simply put out a press release to all local media outlets. We’re not willing to take a chance of getting shut down for something that might not be our fault. It is unfortunate, but we turn people seeking raw milk away every week. The new food ‘safety’ regulations that are coming, will possibly make us reconsider whether we want to grow vegetables to sell. We have complete traceability with our products. Some of the proposed new regulations make no sense for an organic farmer who is already documenting everything they do. To have a successful local food community, there must be places to process your products. There is a severe shortage of slaughterhouses, especially USDA-inspected and certified organic slaughterhouses, which are necessary to be able to label meat as organic and sell to the public or stores. We get asked for organic chicken all the time. There are no local USDA or state inspected slaughterhouses to process chickens. To be able to sell chicken in our farm store, it would have to be raised and processed on the farm. Even if we did process them on the farm, we could not sell them to stores or restaurants – we could only sell them to the end user from our farm store or at a farmers market. We don’t raise chickens for meat because we don’t have the facilities or the time to process them. We’d love to be able to purchase chicken from any of the farms who purchase feed from us to sell in our store, but unfortunately it would be illegal to do so. What is one piece of advice you’d give to new/beginning farmers? Do your research and pencil out the numbers for what you want to do. Don’t be afraid to reach out to other farmers and ask questions. Don’t be afraid to try new things – they may not all work out, but if you don’t try, you’ll never know. Sometimes you’re pleasantly surprised. Make sure you know how you will market your products. Why did you get involved with the Food and Health Network? I’m very interested in building a local/regional food network. I believe it is the only way to have true food security. Where can we find your farm products? Our products are available at our farm store, which is open Friday and Saturday from 10 to 3 all year. The only time it isn’t open on one of those days is if it is a federal holiday. Our products are also available at the following venues: 911 Earth, Athens, PA; Bakery Café, Too, Sayre, PA; Down to Earth Whole Foods, Endicott, NY; GreenStar Cooperative Market and GreenStar Dewitt, Ithaca, NY; Ithaca Beer Company, Ithaca, NY; Finger Lakes Cider House, Interlaken, NY; Lucas Vineyards, Interlaken, NY; Good to Go, Trumansburg, NY; Harbor Hotel, Watkins Glen, NY, and several CSAs offer our products to their members – West Haven Farm, Ithaca, NY; Good Life Farm, Interlaken, NY; and Good Food Collective in Rochester, NY. We hope to start shipping organic cheese from our website this fall.